​Hello and welcome to my business, I'm Nigel Jarvis and I run and undertake all installations. 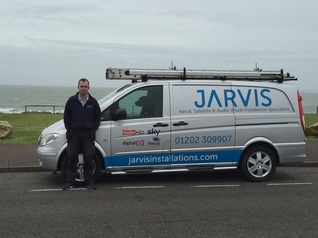 Some of you may recognise the Jarvis name – my family has been involved in Audio Visual Retail, Service and Public Address Hire dating back over 70 years, you may remember our retail shops in Christchurch and Southbourne, or have seen our Public Address Caravans at various events throughout the area. Today I specialise in the installation, service and repair of aerial, satellite and audio visual systems. These systems vary from a house with poor TV picture to a 50 flat complex with picture breakup, a TV that requires setting up to a whole house system with TV’s wall mounted and back ground music throughout. As a small business I will help you right through your project from answering your call or email to undertaking your installation. Although I am busy and sometimes could do with help, I prefer to run my business on my own as I can make sure each installation is as I would want it myself. I have over 20 years’ experience in the industry, so there are not many installs I haven’t seen or had experience with. Take a look at my installation pictures - every picture on this website I have undertaken. ​I make no hesitation that I may not be the cheapest installer out there but I will offer you the best quality installation possible. I will do as I say, will turn up at the correct time, advise you of cost before starting, and will of cause, sort any problems that you may have after. All my work has a 12 month warranty. For most installations I can give a rough price guide beforehand via email or short telephone call. For TV wall mounting why not text or email me a picture and I can normally give you a price without needing to visit. If you would like to discuss your requirements please call me. I can’t always answer your call as I may be on an installation so please do leave your name and number and I will call you back the same day, alternatively send me an email or text message. ​People who I work for include Shorefield Holiday Parks, Hoburne Holiday Parks, Penny Farthing Homes, Morelec Electrical Contractors, Dorset Country Council, Slades Estate agents, Denisons Estate agents, Burns Lettings, Bournemouth University Accomadation, Urban Health & Fitness Gym Christchurch, Meyrick Park Golf Club, Parkstone Golf Club, Barton on Sea Golf Club, as well as numerous other builders, developers and home owners.